Did you really think anyone else was going to be in this spot? 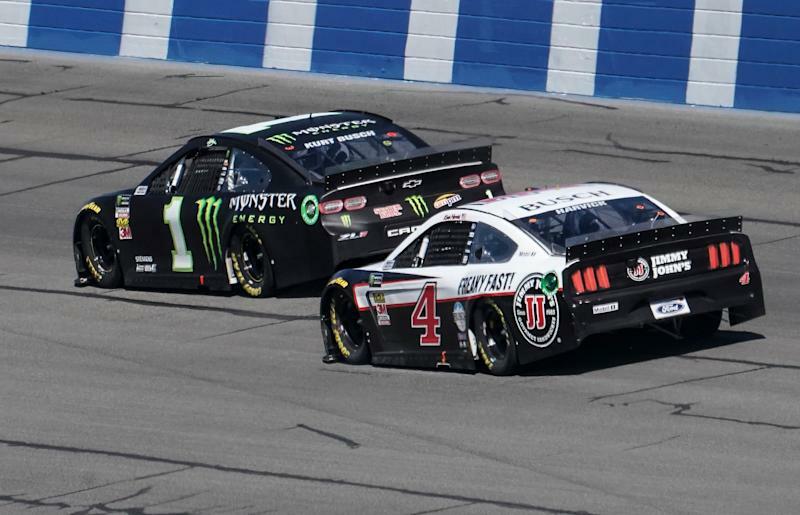 Busch is the hottest driver in NASCAR in 2019. Yeah, he didn’t win Saturday’s Xfinity Series race because of a pit road problem, but after winning Sunday’s Cup Series race he’s now won six of the 10 races he’s entered across NASCAR’s top three series. That’s a win rate that’s not going to last the entire season. Especially when you consider that Busch is limited to just 12 total starts in the Xfinity and Truck Series. But it’s still crazy to think about. Logano was the guy that Busch passed for the win with 26 laps to go. Yes, Busch did have the fastest car in the race. Despite a pit road speeding penalty in the third stage he was able to race his way back toward the front and led 134 of the race’s 200 laps. Harvick doesn’t believe his team has been performing at 100 percent so far in 2019. After getting crashed in the Daytona 500 Harvick has finishes of fourth, ninth, fourth and fourth. When that’s not your best you know you’ve got a really formidable team. Keselowski finished third, a nice bounceback after a tire problem derailed his day at Phoenix. He said that Busch’s car had a distinct advantage on the field through Auto Club Speedway’s expansive turns. Hamlin had a car that was second in the Joe Gibbs Racing class to Busch. But he only came away with a seventh-place finish because he sped on pit road. And while he drove through the field similarly to Busch, he didn’t have the outright speed that his teammate had. 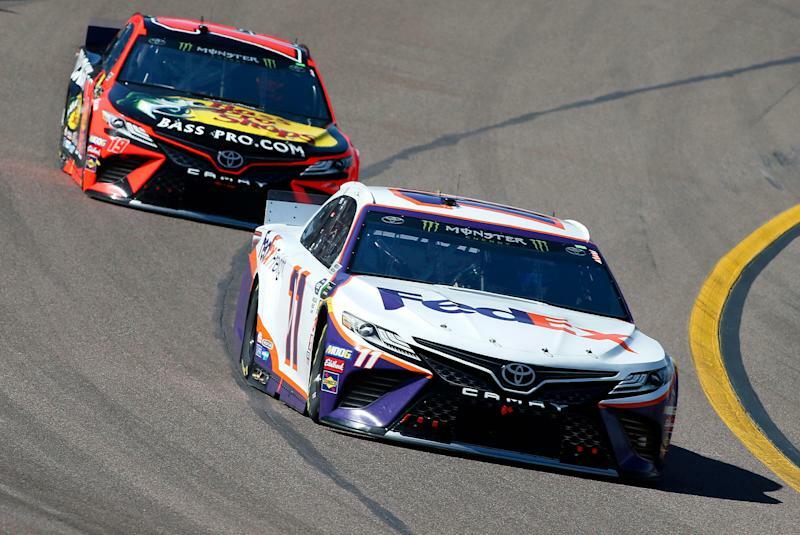 Busch has been far and away the best Chevy performer in 2019. Very few people would have predicted that. He remains the only Chevy driver to get a top five this season and was sixth on Sunday, one of just two Chevy drivers in the top 10. He’s also the only Chevrolet driver to be in the top 10 of the points standings. Blaney finished fifth on Sunday. He’s still a bit behind his Penske teammates but that’s not the worst thing in the world when you consider how fast his teammates have been this season. Blaney and crew chief Jeremy Bullins also lost some track position by staying out on slightly worn tires when a caution came out during the final green-flag pit stop sequence. Truex finished eighth after starting 27th. He made up the most spots of anyone throughout the race. That’s really impressive given the amount of damage Truex’s car sustained on the bizarre one-lap restart attempt at the end of the first stage. The race hardly got going before Ricky Stenhouse spun on old tires at the front of the field. 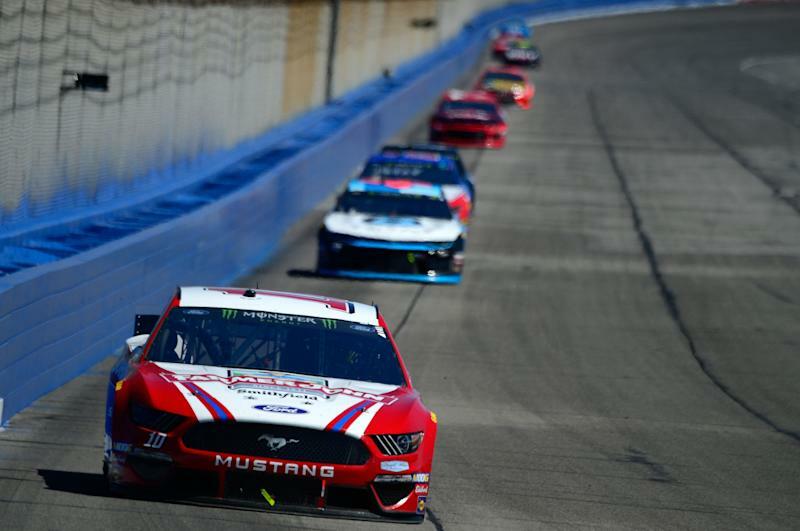 Almirola stays in ninth after finishing ninth. He qualified third on Sunday and has the sixth-best average starting position through the first five races of the season. Larson finished 12th after starting 15th. It was his third 12th-place finish of the season. On the bright side, those three 12th-place finishes are his three worst finishes of the season. Stenhouse did a nice job battling back from that crazy attempt to stay out on old tires in the first stage. NASCAR likes to have stages finish under green, so the gamble that Stenhouse and his team took hoping that the stage would finish under yellow was a high-risk move. He ended up finishing 14th and fell to 11th in the points standings. Elliott finished 11th and is right behind Stenhouse in the standings. He hasn’t finished any better than ninth in 2019 but he also hasn’t finished outside the top 20. While it hasn’t been a blazing start by any means, it’s better than his start in 2018. Lucky Dog: Austin Dillon was sick and still finished 10th after starting first. The DNF: Clint Bowyer’s engine didn’t want to make it to the end of the race.